My husband and I had a week off and went camping in the south-western part of Germany near Freiburg. It was heaven and the weather very sunny and warm. We did a lot of walking and shopping and sightseeing. Yesterday I played around with the new tangle rixty. Somehow I thought it would soon be up for a new challenge. So I have already a Zia for the weekly Diva's Challenge. There is indeed a totally misshapened Y-flip but somehow it looks funny and I like it nevertheless. Unfortunately my scanner changed the dark blue into black. The real colours are dark blue and cyan. I found some nice coloured Pitt artist pens in a little shop in Staufen. Thank you for stopping by and have a nice week. Love the way that you linked some of them together and also the weaving in and out. Das ist großartig! Wunderbare Bewegung und Tiefe von Rixty hier! Auch die Farben sind sehr schön. Die PITT artist pens sind wirklich toll ... ich benutze sie auch sehr gerne! I love how your Rixty weaves in and out. I think that is such a great look. The hint of color is nice too. I wondered how Rixty would look as a tunnel or weaving in and out; you've made it look lovely! Your zia is really great!!!! A very beautiful tile. You found the good combination from patterns to use with rixty. Also the colors are beautiful. Thank you for your lovely comment. 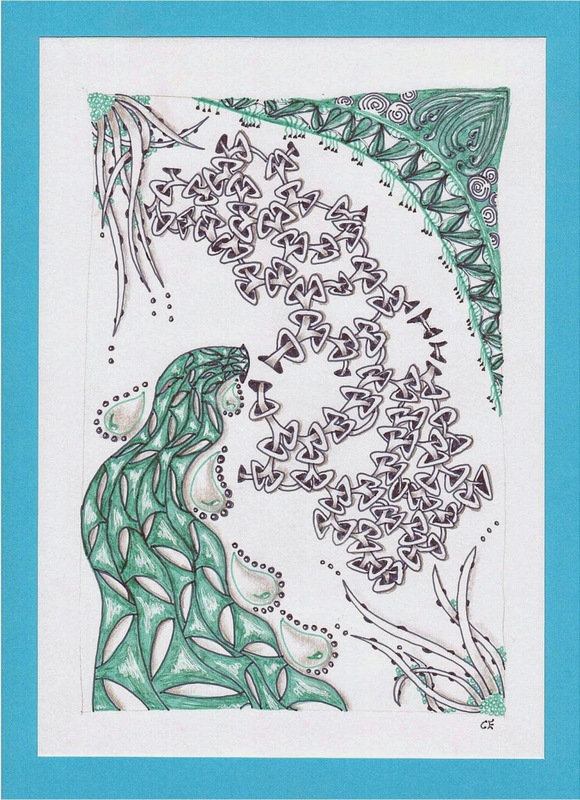 The tangle in the lower left ist Y-flip by Helen Williams. But it's a bit misshapen.